We have a new version of the HACS catalog system. It is an MS Access 10 database application: hacs-4.0.zip. Just download and unzip it. An instruction manual is included: HACS 4.0 Instructions.pdf. Note: these instructions refer to using the app on our local server (N: drive). You will be placing catalog files at whatever location is convenient to you. It should also be noted that this app is for MS Windows only, and you must have a recent version of MS Access to run it. Back in the 1970s the University of South Dakota Archaeology Laboratory received a U.S. Park Service grant to develop a series of short documents about South Dakota archaeology for students. These documents, entitled the Educational Series, have been out of print for a number of years. We recently scanned a set and have made them available for download. The Educational Series were a set of brief documents about South Dakota archaeology developed in the 1970s by the Archaeology Laboratory of the University of South Dakota under a grant from the National Park Service. The series has been out of print some time, but scanned copies are being made available here. To read them, you will need a pdf viewer such as Adobe's Acrobat Reader. No. 9: Developing the Cultural Mosaic: 1400–1700 A.D. 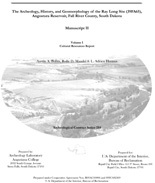 The Archeology, History, and Geomorphology of the Ray Long Site (39FA65), Angostura Reservoir, Fall River County South Dakota, Manuscript I, Volume I: Cultural Resources Report. 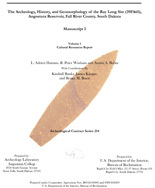 The Archeology, History, and Geomorphology of the Ray Long Site (39FA65), Angostura Reservoir, Fall River County South Dakota, Manuscript II, Volume I: Cultural Resources Report. 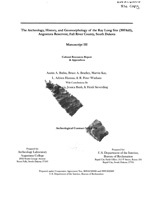 The Archeology, History, and Geomorphology of the Ray Long Site (39FA65), Angostura Reservoir, Fall River County South Dakota, Manuscript III: Cultural Resources Report and Appendices. If you have an event you would like to add to the page, let us know at archaeology@state.sd.us. To expedite the process, please be sure to indicate that you wish your announcement to be included on the events web page. Include contact information including name, phone, and email address.